There’s nothing quite like the wind and the mist in your hair as you sit back carefree and enjoy a ride on a boat. Louisiana has some of the best waterways and coastal areas around. Whether you want to look for alligators, explore the bayou or back country, see the city by water, go on a fishing adventure, or just enjoy being in the sun, there are plenty of places that rent boats for that purpose. Sometimes a captain comes along, too. Here are the best boat rentals in Louisiana. Having a good time is important, but safety is the main concern at J&B Boat Rentals, a full-service marine passenger vessel company in Chauvin, Louisiana. For the past 40 years, J&B has made sure that all their boats are Coast Gerard-inspected and approved annually so you know that you’re renting a seaworthy vessel. You can rent from a variety of towing, specialty, crew, and house boats. They also build seagoing vessels, so if you like the idea of owning your own boat, contact them to find out how. Isn’t it about time you booked that charter boat that you’ve been thinking about for a while? You and up to four companions can set sail for adventure with About Time Boating in Port Sulphur, Louisiana. Tours last about an hour, and going out on the water any time of day provides opportunities for fishing and relaxing. Early in the morning you’ll see some of the most spectacular sunrises, but evenings bring the gorgeous setting sun on the horizon. You’ll see the bayou from a unique view and the camps, oil facilities, and restoration project up and down the coast on your trip. You can make contact any time day or night via email to schedule your trip. Canoe & Trail Adventures is a family-owned business near New Orleans, Louisiana that’s been offering unique experiences for over 40 years by folks who care about the environment. You’ll get the chance to see the local flora and fauna in a way that’s not harmful to the environment because the non-motorized boats like canoes and kayaks are used to show fellow adventurers the wonders of the Louisiana swampland. Imagine slowing paddling through the bayou with a guide who’s knowledgeable of the surroundings. These tours are perfect for any age or skill level, and will give you a look at Louisiana that you won’t soon forget. You work hard and your boat should, too. That’s the philosophy of the folks at T&M Boat Rentals in Morgan City, Louisiana. If you need a hard-working seaworthy vessel to tow or transport equipment or people from one place to another, you’ll want to talk to the friendly folks at T&M Boat Rentals. Whatever you need to move, you’ll find a quick response and reasonable prices for almost any type of project from hauling debris from a restoration project to transporting people to and from the grocery store. Swamps, plantations, and more—oh, my! You’ll have a great time and not even realize that you’re learning something new when you book one of the specialty tours from this family-owned business that’s open seven days a week. When you book a boat here, you’ll get one of the friendliest captains around with a vast experience and knowledge of Louisiana’s unique and amazing Manchac Swamp, a privately owned and protected nature preserve. Pick up is available at downtown New Orleans hotels, and you can often find a discount online. Perfect for young ones and adults! Family-owned and operated T&T Boat Rental in Buras, Louisiana is your go-to place for commercial boat rentals. Offering free local delivery and in-house repairs, there is a good selection of commercial boats available to rent for whatever project you have scheduled. A minimum of three days is needed to rent one of the boats, equipped with radar, GPS, emergency flares, life jackets, and other safety equipment, and insurance is required at the time of booking. Rentals must be done through a business, not by individuals. Louisiana’s Grand Isle is the place where you’ll find Calmwater Charters, and a trip that will give you lasting memories. The goal of this inland fishing and charter boat rental facility is to give you a customized tour that allows you to see the state’s beauty in a unique way. Captain Danny, a licenses Coast Guard captain and expert fisherman, offers fly fishing excursions and bull red fishing that last about six hours for you and a companion. Two-hour boat trips include seeing a pelican rookery, dolphins, and other sights along the coast of Grand Isle. 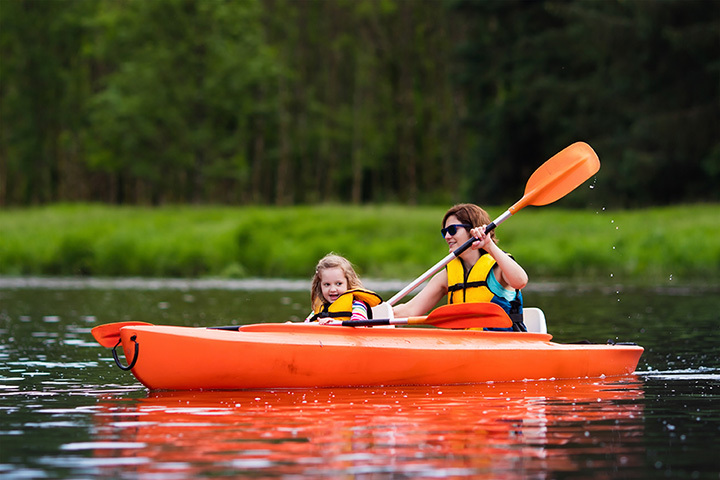 Kayaks can be rented by the day and include life jackets, paddles, and mud anchor. Wanna be a super hero? Wanna learn to fly? You can be both with the help of NOLA Flyboarding in New Orleans, Louisiana. Anyone at least 10 years-old or 80 pounds can learn to flyboard. No experience is necessary and swimming isn’t mandatory, but helpful. A lesson is included in the price, and you’ll be soaring through the air thanks to the water pressure of a long flexible hose. You can also rent jet skis, kayaks, and paddleboards, and if you’re thinking about inviting all your friends, consider renting one of the party boats that hold from eight to 12 people. All rentals are by the hour and certain safety requirements must be completed before rental. Maybe you’ve seen Louisiana by boat, but have you ever seen it by airboat? Open Monday through Thursday, Airboat Tours by Arthur gives you and your family a chance to skim the swamps, marshes, ponds, bogs, and bayous near Des Allemands, Louisiana. You’ll make great memories of the beauty and incredible landscape on this one-of-a-kind experience. If you like the idea of venturing out on your own, you can rent an airboat in sizes ranging from 16 feet to 25 feet. All boats have a canopy so you have protection from the sun or weather and are not difficult to maneuver. You can also arrange for a charter boat for that fishing or frogging trip you’ve wanted to take. Known as the #1 full-service marina in the area, Jean Lafitte Boat Rentals in Lafitte, Louisiana can help plan your next event and launch you into a great time! Whether you’re celebrating with friends, camping with the family, or fishing by yourself, there are boats for every occasion. If you own your own boat, there are boat launches, slips, and storage. Workboats or recreational boats make every day easier and more fun. If you want a really great time, rent one of the hovercrafts and float your way to a good time.